Molybdenum is a silvery-white metal that is ductile and highly resistant to corrosion. It has one of the highest melting points of all pure elements — only the elements tantalum and tungsten have higher melting points. Molybdenum is also a micronutrient essential for life. As a transistion metal, molybdenum easily forms compounds with other elements. Molybdenum comprises 1.2 parts per million (ppm) of the Earth's crust by weight, but it is not found free in nature. The main molybdenum ore is molybdenite (molybdenum disulfide), but can also be found in wulfenite (lead molybdate) and powellite (calcium molybdate). It is recovered as a by-product of copper or tungsten mining. Molybdenum is mined primarily in the United States, China, Chile and Peru. World production is around 200,000 tons per year, according to the Royal Society of Chemistry (RSC). Molybdenite is the primary source of molybdenum. Number of isotopes (atoms of the same element with a different number of neutrons): 24 whose half-lives are known with mass numbers from 86 to 110. Most common isotopes: Mo-98 (24.1 percent); Mo-96 (16.7 percent); Mo-95 (15.9 percent); Mo-92 (14.8 percent); Mo-97 (9.6 percent); Mo-100 (9.6 percent); Mo-94 (9.2 percent). The soft black mineral molybdenite (molybdenum sulfide) was often mistaken for graphite or lead ore until 1778 when an analysis by German chemist Carl Scheele revealed it was neither one of these substances, and was in fact, a totally new element. But since Scheele did not have a suitable furnace to reduce the white solid to metal, it would still be a few years before the element was actually identified, according to Chemicool. In fact, Scheele later became known as "hard luck Scheele" because he made a number of chemical discoveries — including oxygen — but the credit was always given to someone else. For the next few years, scientists continued to assume that molybdenite contained a new element, but it still proved very difficult to identify, since no one had been able to reduce it to a metal. Some researchers did convert it to an oxide, however, upon which when added to water, formed molybdic acid, but the metal itself remained elusive. Eventually, Swedish chemist Peter Jacob Hjelm ground molybdic acid with carbon in linseed oil to form a paste. The paste allowed for close contact between the carbon and the molybdenite. Hjelm then heated the mixture in a closed crucible to produce the metal, which he then named molybdenum, after the Greek word "molybdos," meaning lead. The new element was announced in the autumn of 1781, according to the Royal Society of Chemistry. Most commercial molybdenum is used in the production of alloys, where it is added to increase hardness, strength, electrical conductivity and resistance to wear and corrosion. Small amounts of molybdenum can be found in a wide variety of products: missiles, engine parts, drills, saw blades, electric heater filaments, lubricant additives, ink for circuit boards and protective coatings in boilers. It is also used as a catalyst in the petroleum industry. Molybdenum is produced and sold as a gray powder, and many of its products are formed by compressing the powder under extremely high pressure, according to the Royal Society of Chemistry. Due to its high melting point, molybdenum performs incredibly well under very high temperatures. It is particularly useful in products that need to stay lubricated under these extreme temperatures. So in cases where some lubricants and oils might decompose or catch on fire, lubricants with molybdenum sulfides can handle the heat and still keep things moving along. Molybdenum is the 54th most common element in the Earth's crust. 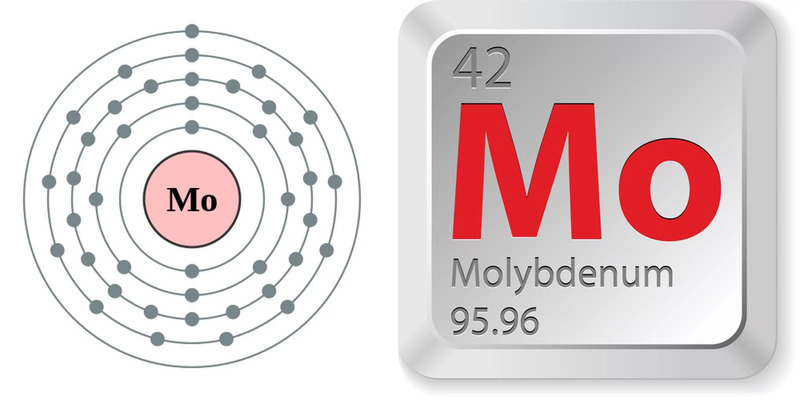 The molybdenum atom has half the atomic weight and density as tungsten. Because of this molybdenum often replaces tungsten in steel alloys, offering the same metallurgical effect with only half as much metal, according to Encyclopaedia Britannica. "Big Bertha," the German 43-ton gun used in World War II, contained molybdenum, rather than iron, as an essential component of its steel, because of its much higher melting point. Molybdenite, or molybdena, is a soft black mineral once used to make pencils. The mineral was thought to contain lead and was often confused for graphite. Molybdenite is used in certain nickel-based alloys, such as the Hastelloys -- patented alloys that are highly resistant to heat and corrosion and chemical solutions. Molybdenum is a micronutrient essential for life, but too much of it is toxic. Molybdenum is present in dozens of enzymes. One of these important enzymes is nitrogenase, which allows nitrogen in the atmosphere to be taken up and transformed into compounds that allow bacteria, plants, animals and humans to synthesize and utilize proteins. In humans, molybdenum's main function is to serve as a catalyst for enzymes and to help break down amino acids in the body, according to Drweil.com. In plants, molybdenum is an essential trace element necessary fornitrogen fixation and other metabolic processes. Molybdenum has the unique quality of being less soluble in acidic soils and more soluble in alkaline soils (it's typically the opposite for other micronutrients). Therefore, molybdenum's availability to plants is quite sensitive to pH and drainage conditions. In alkaline soils, for example, some plants can have up to 500 ppm of molybdenum, according to Lenntech. In contrast, other lands are barren due to a lack of molybdenum in the soil. Another interesting use for molybdenum is its role in scientific research. Molybdenum is very abundant in the ocean today, but was much less so in times past. This allows it to serve as an excellent indicator of ancient oceanic chemistry. Scientists in the field of biogeology, for example, study the amount of molybdenum in ancient rocks to help estimate how much oxygen may have been present in the ocean and/or atmosphere during a certain time period. Several years ago, researchers from the University of California, Riverside, suspected that deficiencies in oxygen and molybdenum may have been responsible for a major lag in evolution. They knew that around 2.4 billion years ago, there was an increase in oxygen on the Earth's surface and that oxygen was able to reach the ocean's surface to support microorganisms. However, the diversity of living organisms remained very low. In fact, animals did not appear until almost 2 billion years later — or around 600 million years ago — according to the study press release in Science Daily. When deprived of molybdenum, bacteria cannot convert nitrogen to a form useful for living things. And if bacteria cannot convert nitrogen quickly enough, then eukaryotes cannot thrive because these single-celled life forms are unable to convert nitrogen on their own, according to Science Daily. For the study, published in the journal Nature, the researchers measured the levels of molybdenum in black shale, a type of sedimentary rock rich in organic matter and often found deep in the ocean. This helped them estimate how much molybdenum may have been been dissolved in the seawater where the sediment had formed. Indeed, the researchers found strong evidence that the ocean at this time had been lacking in important molybdenum. This would have had a negative impact on the evolution of early eukaryotes, which scientists believe gave rise to all animals (including humans), plants, fungi and single-celled animals like protists.